X-games gold, world champs. Antti Autti's background is in freestyle snowboarding competitions and especially in transition riding. But his passion has always been just riding itself. When he was traveling the globe for competitions he began noticing that there was no time to fulfill his passion of backcountry riding and exploration. In 2010, Antti left competitions at the highest level in the industry so he could focus on backcountry shredding. Since then he has produced multiple films and web series with one goal in his mind - snowboarding should make people want to go out and enjoy life. On this topic, Antti says, “It does not make sense to create videos only for yourself. Every project or mission that I want to do is about something that the viewer can relate to, no matter if it's life itself or just the action.” Antti's future plans include traveling deep in the backcountry of the Arctic Circle, Alaska, and Japan. This spring I went to Svalbard. We had the opportunity to travel by sea to the most northern point of Europe and found amazing terrain there. In Svalbard, you have to deal with polar bears and moving ice. Needless to say it was quite an experience to try to keep the concentration on point when we were splitboarding up this couloir while huge male polar bear was walking by our tracks only few hundred meters away from us. Luckily it was not interested of us and we were able to ride the line at 2 am in the morning in a place where the sun doesn't set for almost 4 months. I have some cool plans but generally, I'm excited that this is going to be one of the first seasons for me where I'm fully focusing on making a great splitboard film project that does not only focus on riding the biggest lines or deepest powder. To me, snowboarding is about transitions and I plan to go find some really nice ones in the wilderness this winter. Nicolas Muller, Terje, and Jeremy Jones. I love the way they ride! I've been watching Jeremy's old video parts so much lately. It is the calculated snowboarding yet still so powerful whereas Nico & Terje riding attracts me so much because they find these little gems and transitions everywhere they ride. To be able to live fullest in every moment of life. 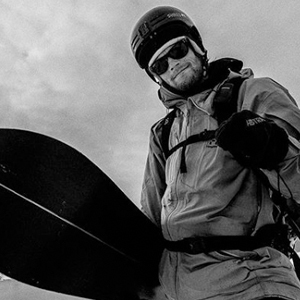 The best and most reliable splitboard bindings and equipment there is. They are effortless to use in the backcountry. As a rider who wants to move quickly up and down, I really love the fact that Spark R&D gear can be used without any hassle in the situations where setting up your board has to be fast.